So, like many of you – fall is my favorite time of year and I love pumpkins and all things pumpkin. Every fall I find a day to dedicate to pumpkin madness. So, today was that day. I like to make all things pumpkin. Bread, pancakes, waffles, smoothies, ice cream, muffins and pumpkin-sauce. I like to put them in mason jars or baking paper and freezer bags to stock up for the winter months. 10 pie pumpkins. If you don’t purchase organic, I would suggest scrubbing them with castile soap before cutting and roasting them. DO NOT REMOVE THE SEEDS! Just simply slice in half. A Ninja, Food Processor or Magic Bullet (If you do not already own one of these kitchen magicians, I highly recommend investing in one. Personally, my favorite is the ninja). So, I do not remove the seeds from my pumpkins when I puree them. Why? Because those seeds are little nutritious goldmines and I would hate to miss the opportunity to turn my baked goods into superfoods. Those little guys pack in: magnesium, zinc/immune system support, support for healthy eyes, bones, teeth and gut, healthy digestive function, DHA, EPA, ALA and omega 3’s, they have anti-inflammatory benefits, natural insulin regulation (anti-diabetic properties) and so many more benefits it would be nearly impossible to name them all. In addition to that, the flesh of the pumpkin is packed full of vitamins and antioxidants, including more than 100% recommended daily amount of A and E.
Simply put your sliced pie pumpkins in glass baking dishes, fill half full with water and bake them in the oven. There are two temperature options – 350 degrees for 2 hours or 140 degrees for 4 hours. The benefit of baking lower and slower is to keep the pumpkin in a raw state which maintains higher benefits and nutritional value. When the come out of the oven, allow them to cool before you begin scooping the insides out and into your food processor. For every 2 cups of pumpkin, add 1/4 cup of your milk of choice (or purified water) and a few dashes of cinnamon to taste. You will need to run the processor for several minutes to completely break down the pumpkin seeds so they become part of the puree. You will know you accomplished this when your puree is smooth like applesauce and has no lumps. For the 5-10 minutes you are blending (offering your device plenty of breaks as not to overheat it) be sure to pump up some music and dance around your kitchen like the domestic goddess you are! …show us your moves, girl! 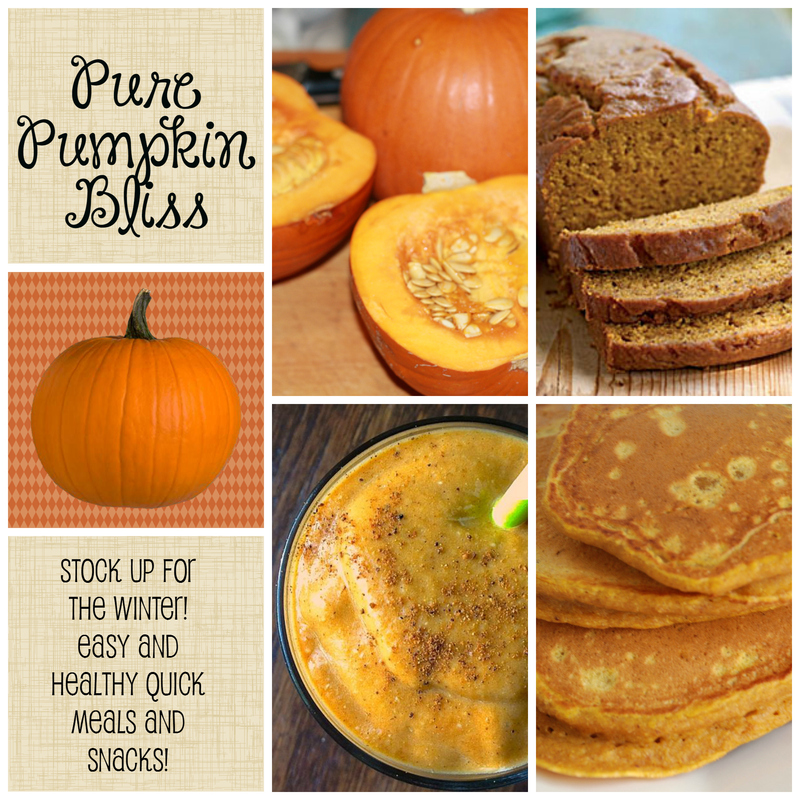 Store puree in mason jars or freezer bags and use them as needed to make your favorite pumpkin recipes! Good Morning from Crunchytown! This morning I realized something awful: I am out of wheatgrass. How did I let this happen? I jumped on Amazon to re-order, stat – and then felt inspired to share some of this amazing-ness with all of you. A serving of this superfood jam packs: Vitamins A, B6, B12, C, D, E, & K, Thiamin, Riboflavin, Niacin, Folate, Pantothenic Acid, & Cholene. Also, tons of minerals: Calcium, Iron, Magnesium, Phosphorus, Potassium, Zinc, Copper, Manganese, & Selenium. Improves circulation, helps absorption of other vitamins and minerals in your diet (suppressing appetite and sugar cravings), reduces inflammation, has natural detoxing effects to rid your body of environmental toxins and those found in our food, helps with digestion, helps heal digestive issues and leaky gut, helps with joint pain/arthritis, assist in dental healing, breaks up congestion to help fight colds/sinus infections, stabilizing blood sugar, promote clear and healthy skin, hair and nails, prevent cancer by creating an environment in your body where cancer cells cannot thrive, destroys un-healthy bacteria in your body, boost immune system, and it can replace your need for vegetable intake on the days you use it (though we would never recommend replacing those great greens!). The list certainly goes on and on and the best thing is: Studies have never shown wheatgrass to be toxic to humans or animals in any amount. Because the vitamins and minerals in this superfood are from a living plant and completely natural, it is hard to overdose on them. However, please remember that less is more and there is such a thing as too much of a good thing. Follow the serving recommendations on the kind you purchase and do some research to find the right amount for you. In my family, we use about 4 grams as 1 serving, and I give my children 1/2 of a serving every day. Swish a shot of wheatgrass instead of mouthwash to re-mineralize your teeth, fight cavities. It has a ton more benefits than toothpaste or mouthwash. Boil a serving in a small saucepan and inhale the steam to clear out congestion related to cold/sinus/allergy infections. Add to juice, applesauce, smoothies, etc – or just drink a quick express shot to kickstart your day. Wheatgrass is made from a living plant, and it is very important that you consume wheatgrass grown in organic soil and in pure form – so it is gluten free. Let’s get shopping! This is the only brand I trust – I know that they use 100% organic practices, no-GMOs, no pesticides and have been proven safe and effective. I encourage you to give it a try for 2 weeks and see if you feel an amazing difference in how you look and feel! If you are anything like me, you go apple-crazy in the fall. My family and I love apples, and I especially love the great prices at orchards vs the high price tag at the local grocer. Just today, I visited Country Mill Orchard and came home with over 30 pounds of freshly picked organic liberty and crimson crisp apples. Here’s what I plan to do with them – to preserve them for the winter and beyond. Making fresh juice and freezing it makes for a great and delicious way to enjoy extra apples in the coming months. The recipe is so simple and easy! I take about 10 pounds of washed and cored apples (with skins on) and 1 lemon with the peel removed. Juice them to make approx 1 gallon of fresh juice. I then freeze it by pouring it 3/4 full into bottles. It can simply be placed in the refrigerator when you are ready to thaw, and I mix it with equal amounts of water to make the perfect juice blend for my family – with NO added sugar! If you have a fantastic juicer like this one, you will be able to use the pulp from the apple juice to make a delicious applesauce! Simply collect the pulp and pour into a saucepan with 1/4 cup of the apple juice you just made and a few tsp of cinnamon. Simmer for 5 minutes on low heat. Every edible part of the apple was used and no benefits were left behind! I never peel my apples. There are so many nutritious benefits in the skin of the apple. Surely you could modify this recipe and remove the skin if you choose. Take 4 chopped apples, 1/2 cup of water, 1tsp cinnamon, 2 tsp lemon juice and 1/4 cup of honey. In a saucepan, combine apples, water and cinnaon and cook for about 15 minutes on low heat until apples are nice and soft. Allow to cool to room temp, add the honey and stir. Store in refrigerator or freezer. Yum! Simply slice up some apples, soak them in a bowl of lemon juice – leave out for a few hours to dry and seal in freezer bags. This makes for an easy grab-and-go snack for later on. My kids even love them frozen! Prepare your favorite apple pie filling recipe and put it in freezer bags for future baking! If these suggestions haven’t offered you the perfect way to preserve your apple bounty, be sure to check out this amazing list with 18 additional ways to stretch this apple love. Cheers, and happy apple picking!